Athens-based architect Natalia Kokosalaki combined timber and stone with less traditional materials like perforated steel to give the interior of this chalet in the Greek town of Livadeia a contemporary edge. 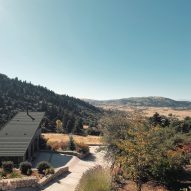 The chalet is located 15 minutes from Greece's largest ski resort on the slopes of Mount Parnassus, on a site that is close to a rocky stream and surrounded by fir and chestnut trees. Completed in 2013 as one of a cluster of holiday homes designed by architects Roula Kotsilati and Vagelis Chatzis, it was purchased by a young couple who invited Kokosalaki's studio to develop the unfinished interior. 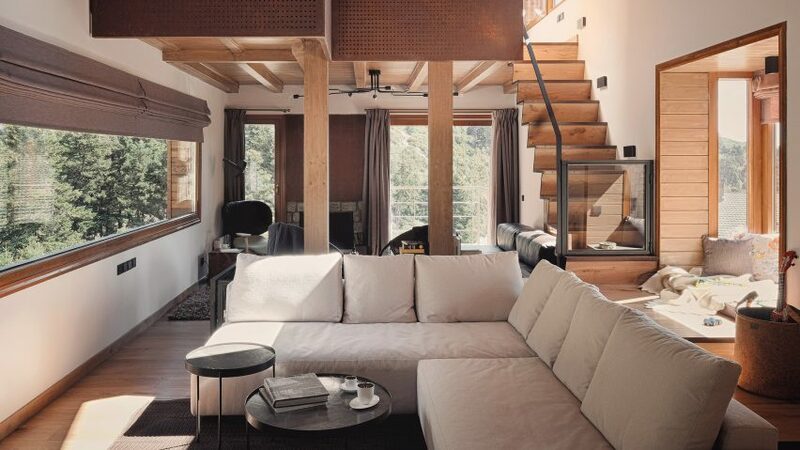 With an empty shell as a starting point, the architect and her team set out to challenge the format of typical chalet interiors and create a modern living space that complements the mono-pitched building's dynamic design. 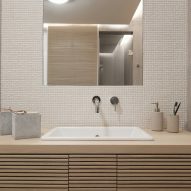 "Our design vision was a contemporary yet warm space that respects the existing cell and integrates well with the extraordinary surroundings," Kokosalaki told Dezeen. 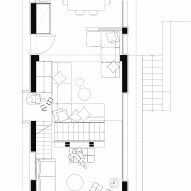 "Our main design strategy was to create an open-plan space, blending ideas of two different types of dwellings, the chalet and the urban loft." 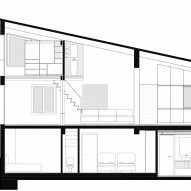 The studio was able to make some alterations to the building's shell and chose to alter the shape and size of openings to improve views towards the surrounding woodland. 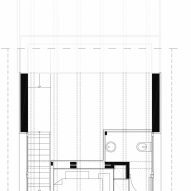 With no internal walls or floors already in place, Kokosalaki also organised the interior layout of the 150-square-metre building to optimise the views and create cosy spaces such as window seats. 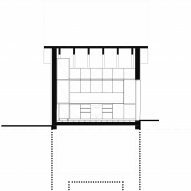 The three-storey structure accommodates bedrooms, a bathroom and sauna on its lower level, with the main entrance on the ground floor opening into a living space and kitchen. 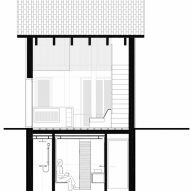 A more intimate lounge area is arranged around a fireplace at the far end of the ground floor, while a mezzanine level above provides space for an additional bedroom or study. 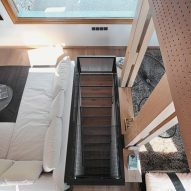 The studio's key intervention was the introduction of a thin metal staircase connecting the living space with the mezzanine, which is wrapped with sheets of perforated weathering steel. Circular holes in the metal vary in size depending on their position, resulting in a visually lightweight divider that allows daylight to pass through and at night diffuses artificial light so it crosses between the spaces. Other materials used throughout the project combine familiar rustic references with the more contemporary language of industrial finishes and textures. "With this project we revisited the idea of mountainside design," Kokosalaki added, "in order to counterbalance the dynamic design of the existing exterior with a new adequate interior that combines modern materials within a more rustic context." Timber, stone and soft textiles contribute to the cosy cabin-like feel, while laser-cut metal, slatted timber surfaces, netting and textural 3D mosaic tiling introduce modern touches. Photography is by Dimitris Kleanthis.